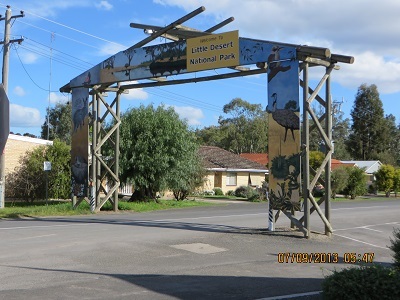 On my way from Adelaide to Bendigo I couldn’t resist the temptation to re-visit the Little Desert National Park in the Wimmera Region of Victoria. I last visited this Park in September 2013 and logged 30 contacts over the visit from two activations in two different parts of the Park. Here is the link to my first activation of this Park. I went back to Horseshoe Bend. I was on the air at 21:30 hours (20/12/2014) well before UTC rollover. After 31 contacts on 40 metres I moved to 20 metres (14.315) but could not get a contact. I had a listen around the band and there were a few strong signals and a WIA broadcast signal from NSW. I now have 61 contacts from this Park qualifying it for the WWFF award system. This is my first Park with over 44 contacts. Thank you to all the amateurs who made this possible. All contacts for this Park can be seen at my log page at HRD.log and have been up-loaded to LOTW as well. Thanks to all of those amateurs who made contact with me this morning while I operated in the Little Desert National Park at Horseshoe Bend picnic and camping ground. I had the place to myself. The sun was shining and it was warm. 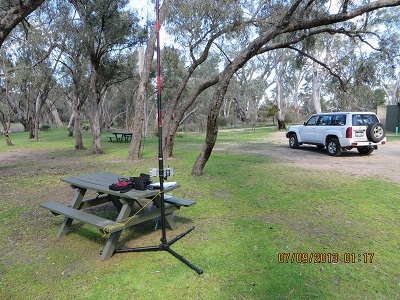 I had access to a park picnic table but I used my tripod to support the 10m squid pole. The dipole ends were up high in trees and I was happy with the antenna installation. The first two contacts were at 23:50 UTC. VK5MBD/p, Bill at Northfield and VK5ST, QRP, Steve (6th September) with really good signals both ways. I knew then, or at least I hoped, I was going to be in for a great morning! And it was: contacts were with VK3MRG, QRP, Marshall at home in Kew, 00:00; VK5LA, Andy; VK3CAT, Tony; VK3PF/p, QRP, Peter; VK3AFW, Ron; VK3DEE, Mark; VK5NJ, QRP, John; VK5NQP, David; VK3ZLD, Lou; VK5FTCT, John; VK3MCD\p, QRP, Brian in the Grampians on VK3 VW007; VK5PAS/p, Paul on VF046, Mt Napier; VK5LY, Larry; VK5IS, Ian; VK5LDM, Dennis, VK3AMB, Bernard; VK3TJC/m, Tim; VK3LP, John; VK3UBY, Col; VK3PI, Mark; VK2UH, Andrew; VK2EAR/p QRP, Michael in the Blue Mountains; VK3FMPB, John; VK5FWMA, Bill; VK5DJ, John and at 01:12, VK5AV, Tim at Mount Gambier, making 28 contacts in an hour and a quarter. On Sunday 8th September I thought I would try 20m. I had two contacts from the Sanctuary Picnic Ground (within the Park) as I only had about half an hour before going to the Little Desert Lodge to visit the Mallee Fowl aviary. I was pleased to work, Pat, VK6QL, 5 and 8 and 5 and 7 to me, at 00:01 and Nigel, ZL1BY, 5 and 7 and I received 5 and 2. I thought that was pretty good!